Say you ordered a vegetarian dish, and got an add-on of meat; of course you’re willing to pay a little extra for the add-on, but how much is acceptable? If your dish is an $18 risotto, would you accept an extra $5 for some shrimp? How about $8? This past Friday, I met up with a few friends at Mrs. K’s Toll House Restaurant. It’s in an old converted toll house, just north of downtown Silver Spring. It’s surrounded by green, manicured gardens, and the location itself is a beautiful building full of antique furniture. I loved it. Great ambiance. The service was wonderful, too, very attentive and courteous, and the food was delicious. Yes, that’s more than just mushrooms. When I ordered, the waitress asked if I would like to add on some shrimp. And I said, sure! I didn’t mind paying a little extra for protein. 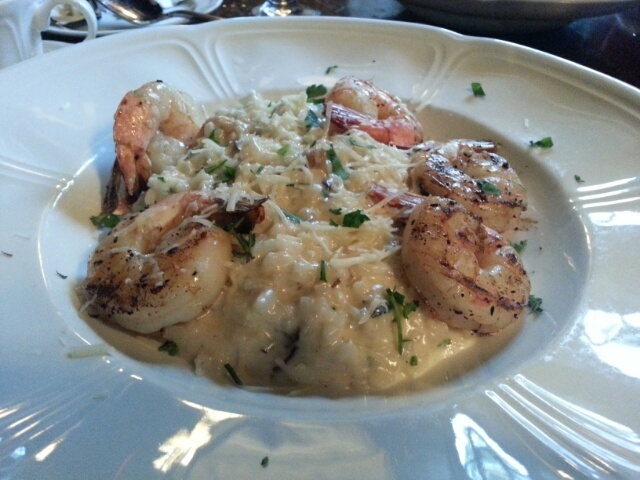 The shrimp, blackened and just a hint spicy, was a delicious counterpoint to the rich, creamy risotto. It was an great pairing – kind of like an amped-up shrimp and grits. Really, everything was going swimmingly until we got the bill, which showed that I had spent $18 for my mushroom risotto, and $16 for the add-on of shrimp. I called the waitress over, just to make sure there wasn’t some mistake, and she verified that yes, I had paid $16 – almost 90% of the cost of my entire entree – for five pieces of shrimp. I mean, it was good shrimp, but not that good. This meant that my shrimp-and-mushroom risotto came to a grand total of $34, which, I believe, made it more expensive than anything on the menu except the crab cakes and the filet mignon. Sure, I could have (and should have) asked what the charge would have been for the shrimp add-on. But, you know, if adding on a protein effectively doubled the price of someone’s dish, you’d think it would be polite to mention it, right? I thought briefly about stiffing the waitstaff on the tip, but the service really had been exceptional otherwise, and besides, our party of five had an automatic service charge on the bill. So I let it go. But I’m definitely not going there to get upsold again. This entry was posted in local, peevishness by kat. Bookmark the permalink.